Secure Socket Layer (SSL) encrypts all of the communication between the web site and its visitors. This makes it so that when the buyer sends their credit card information over the internet it's kept completely private and secure. SSL is an absolute must if you plan on running an ecommerce site, no matter what CMS or plugin you use. If you're interested in the technology behind SSL check out this Wikipedia article. SSL works by having a digital certificate on your server that is officially and legally signed by a 3rd party company. There are a variety of companies that can create the certificates, and they've all been required to prove that they are reliable and secure. When the browser connects to the server it validates the certificate and then creates an encrypted browsing session. If you want your site to run SSL you must buy one of these certificates. We recommend namecheap.com. Important: An SSL certificate will only work on the exact domain name they were purchased for. 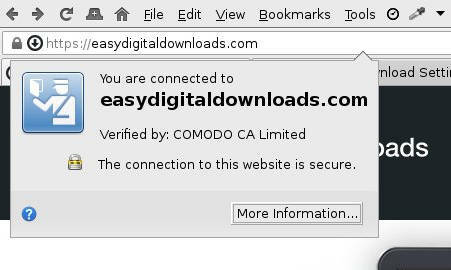 www.example.com and example.com are different as far as SSL certificates go. You must choose one or the other and use only that one. install the certificate for you. Either way the technical difficulties should be taken care of for you. Once your SSL certificate is installed go to Downloads → Settings → Misc and enable Enforce SSL on Checkout. This will force the browser to use the SSL version of your web site if it isn't already, ensuring that communications are encrypted. The EDD setting above only ensures that your checkout page is using your SSL certificate. To force the rest of your site to do so as well we suggest using any one of the plugins listed below.